MAKE YOUR VOICE HEARD FOR ISRAEL – NOW! 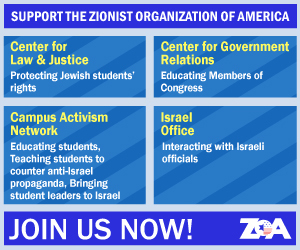 The Zionist Organization of America (ZOA)’s Annual Capitol Hill Advocacy Mission in Washington, D.C. will take place on June 19-20, 2019. Now more than ever, it’s crucial that our lawmakers hear from you and all of us about the importance of ensuring Israel’s safety and security. These times remain perilous and much of the world remains hostile to the Jewish State of Israel. You can help educate our lawmakers in Washington, D.C. about the perils that Israel faces – which also affect our own country’s security. You can have a voice in shaping U.S. policies that are beneficial to Israel and the U.S. Please join us for the ZOA’s Annual Capitol Hill Advocacy Mission, June 19-20, 2019. Read full invitation letter here. Join fellow Zionists from around the country for a Kickoff Dinner to launch the Capitol Hill Advocacy Mission, giving participants a chance to mingle and enjoy the evening while featuring an exciting guest speaker. Attend a luncheon while hearing from ZOA and congressional speakers, followed by meetings with the office of your senators and your district’s representative for our lobbying mission. The Liaison Hotel, Capitol Hill, Washington, D.C. To make a reservation, click here or call The Liaison at 1-888-214-7555 and request a room in the ZOA bloc. Rooms are $269 plus tax and service charges. *June 20 Location: Capitol Hill, Washington, D.C. Buses will be available from NY/NJ and back. For adult registrants, bus option is an additional $100. Students receive complimentary bus seats. * Please note that by filling out the form today, we will reach out to you separately for payment. Registration will be complete upon receiving payment. Thank you and Chag Sameach!